Pasko Farms LLC is a family-owned, Michigan based farm. We specialize in a variety of agricultural activities such as the production and distribution of swine and poultry. Our farm also has goats and the standard dogs, cats and a rescue horse. For over twenty years, we harvested eggs, pork and fowl for our family and friends. We commercialized the activity when we branched-out at the request of individuals and businesses to supply these items. We raise geese and standard and heritage turkeys. In 2012 we supplied Embden geese as well as well as Broad Breasted White, Broad Breasted Bronze and Red Bourbon turkeys. We’ve raised ducks mainly for 4-H projects; however for 2013 we are raising the prized Muscovy ducks. These items were supplied to individuals as well as to restaurants. We only use a high quality, USDA exempted processing facility (Munsell’s Poultry Processing – see munsellspoultryprocessing.com) and we maintained a Michigan Department of Agriculture licensed Food Warehouse that allowed us to store food commercially for sale. Pasko Farms LLC also is involved with swine. In addition to the standard domestic breeds, we were lucky enough to team up with Pure Mangalitsa (see puremangalitsa.com ). The Mangalitsa breed is a heritage breed that has been called the Kobe beef of pork. 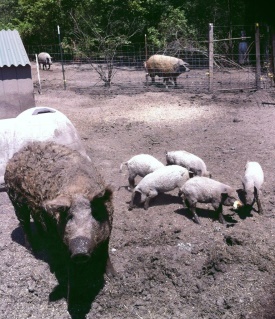 We partnered with Pure Mangalitsa creating breeding stock as well as product for sale. Please feel free to contact us at: Pasko Farms LLC. Copyright © 2013-2019, Pasko Farms LLC. All Rights Reserved.